Emei Shan, (mountain) is one of the most renowned Buddhist and Daoist sanctuaries in China. The mountain is located in the basin of Sichuan Province. The beautiful majesty of this mountain has caused it to be named Emei, “The most beautiful mountain under heaven.” Visitors of this mountain are treated to several peaks, bubbling springs, cascading waterfalls, tall ancient trees and abundant flowers along the many mountain paths leading to the many scenic spots and temples that dot the mountain side from the base to the summit. The vast difference in the temperature on the summit and below at the base of the mountain allows for a great diversity in plant and animal life. While spring flowers bloom at the foot of Emei, the summit is still covered in snow. Known to botanists as a botanical wonderland Emei houses more than 3,000 identified species of plants. Because of the various rare herbs and medicinal plants that also flourish here Mount Emei was a favorite dwelling place for Daoist herbalists among them the Jiulong Baguazhang founder and Daoist master Li, Ching-yuen. Scientists have recently identified over 100 rare plant and herb species that exist only on this mountain. Emei is famous in China for numerous rare and mysterious martial arts that developed there from the Gongfu (Hard work over time) of Daoist, Buddhist and also laymen. 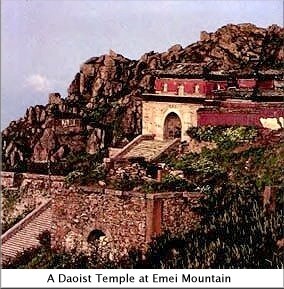 Daoist temples were first erected on this mountain in the eastern Han dynasty (200 B.C.). Later Mount Emei became one of the holy Buddhist Mountains when Buddhism flourished in the Tang dynasty (800 A.D.). At one time over one hundred temples were operating simultaneously. Buddhist and Daoist monks lived in harmony practicing meditation, healing arts Daoyin (Yoga) herbalism and the various modalities of their spiritual practices. Even today there is left behind in the museums a great wealth of poetry, literature, painting and medicinal knowledge as well as martial arts that developed on Mount Emei. Martial art methods came collectively to be called the Emei Wushu school. Many of the arts blend the training methods, sparring techniques, hand forms, and weapon forms of both Buddhist and Daoist styles into one. Traditional Emei Wushu is both Buddhist and Daoist in nature as well as a mixture of internal and external martial arts. At the same time, the Emei school has extracted the essence of Shaolin, Wudang and other schools of Northern China. Many famous body guard families and military men have also visited the Mountain to learn martial arts and later developed their own styles from the eclectic methods that flourished on Emei. In this way hundreds of “hidden” styles many of which were taught only to member of a family or clan were created thrived and later disappeared. Being mysterious has always been the perception of many people about Emei Wushu. That is because the Emei Wushu has never been readily passed on to “outsiders.” There is an old Chinese saying, “Shandong province has highwaymen, Hebei province has Wushu experts, and Sichuan province has the men of Emei chivalry.” This means that these three provinces produce top quality Wushu talents. However, the Emei chivalry man is mysterious and is similar to the Chinese legendary Yuxia (Knight Errant) who like Chinese robin hoods performed only good deeds and keep their methods hidden from the eyes of the profane. 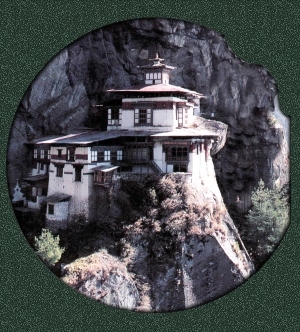 A few of the rare “hidden” styles are said to still exist in and around this mysterious abode of Daoists and Buddhists. Emei Snake – There are three sets of Snake forms in the Emei school. The first one emphasizes Qinna (locking) and the pressure points techniques, the second one on the wrestling techniques, and the third one on striking techniques. All techniques are required to be executed swiftly, accurately and ferociously. Monk Xu Kun taught the three snake forms to Mr. Liang, Zhi-Xiang. Master Liang, Shouyu of Canada is a direct inheritor of this system. Tibetan Cobra Boxing – Another style of snake boxing, Tibetan Snake Boxing (Coiling serpent) is part of the Li family Daoqiquan style and was developed by Lama Zurdwang near the area of Emei Mountain. Dr. Painter is a direct inheritor of this rare method of ground fighting. White Eyebrow – Founded by Daoist monk named Bai Mei (White eyebrow), this branch is characterized by hard and explosive short movements. Bai Mei is also famous for being capable of almost supernatural feats of skill with Baguazhang methods of mysterious origins. Emei Dragon – There is the Green Dragon form by Monk Dan Zhen of Chunyang cave at Mt. Qingcheng. There is the Swirling Dragon form of the Green Coat Palace in Chengdu, the Black Dragon form by Priest Ji Shan of Fuhu Temple, the Plum Blossom Dragon form by Nun Wu Mei, the Fire Dragon form by Daoist monks Shen Deng and Qing Xu, and the Golden Dragon form. Emei Tiger – The Emei school has many different Tiger forms. Some of them are the Hungry Tiger Snatching Food form, the Five Tiger form, the Tiger Roar form, the Black Tiger form, the Tiger Claw form, the Fuhu form and the White Tiger form. WuJi Form – This form is a blend of Daoist and Buddhist martial arts. Like Taijiquan it is soft, yet dynamic. It stresses the use of internal Jin and applications. There are two sets of Wuji form. One set develops power and “explosive” jin . The other set is mentioned in history books; no one has claimed to know it yet. This form is only known by a handful of masters and it is taught to pupils who are carefully selected by the masters. Emei Sword Fairies – This branch, founded by Hui Yun, is based on Daoist and Buddhist Xiu Sheng Shu (the art of life or essence enhancement). There are numerous Qigong exercises, fist forms and weapon forms. A controversy still smolders over the existence of a true Emei Baguazhang system. Some historians claim there is no Emei Baguazhang apart from the art developed by Dong, Hai-Chuan in Beijing and imported to the Mountain. Others claim that the Daoist monk who reputedly taught Dong was a member of the Dragon Door Daoists. This sect that had many branches throughout China some of them at Emei Mountain. They developed a circle walking meditation based on the Yijing over 2,000 years ago. As we have said before, “History is a pale shadow of the truth,” no one knows for sure and Dong would not admit where he learned his art. Many of the systems of Baguazhang on Mount Emei and there are numerous forms of the art, appear to have stemmed from Yin Fu a famous disciple of Dong, Hai-Chuan. Shengmen Baguazhang – (Generation Door Bagua) Based on the use of the Yi (mind intent) and the Yijing theory. Sengmen Baguazhang – (Monk Family Bagua) This branch is also known as the Buddhist branch. It is characterized by high stances. Imported by Shaolin monks to Emei this was part of a larger system of Shaolin Wushu. You Shen Baguazhang – (Swimming Body Bagua) Specializes in neutralizing energy, withdrawing and dodging methods. One famous Emei Baguazhang master on Emei was Li, Zhangye, titled “the Longevity Monk,” of the Emei Meeting Fairies Cave. Li was exceptionally good in You Shen Baguazhang. At the age of 108, he admitted his last disciple, Lui, Zijian, to his school. Lu was also the student of Yin Fu the famous Baguazhang master a student of Dong, Hai-Chuan of Beijing. Lu later joined Shaolin and Wudang schools. At the age of 91 years old and he was still very quick in his movements. 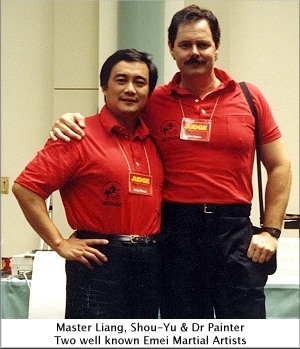 That the above methods of Baguazhang can be traced to Dong’s students still does not prove that other methods of circle walking and Yijing based martial systems did not live in family and private styles practiced by Emei Daoist and Buddhist monks. Even today reliable sources report to have witnessed a group of Daoists who nightly practice the Nine Palace circle walking and Rotating in Worship of Heaven Baguazhang exercises on Emei Mountain at a secluded spot near the White Cloud Temple. The Li family’s Jiulong Baguazhang system said to have been conceived by Li, Ching-Yuen while living in the Emei Mountain region is like many other martial art and Qigong methods created by laymen and secular Daoists. It was seldom taught to anyone other than to the Li male family members until after 1956. This classifies it as a family system. Like many other methods Jiulong Baguazhang being a family style it is not often included in the official lists of the publicly taught Emei Wushu Baguazhang methods as practiced by the Emei Wushu Association. This fact makes Jiulong Baguazhang no less an Emei martial art as its principles are thought to be derived from the Yijing and the Daoist sect who either taught Dong, Hai-Chuan or from the very Daoists whom legend says taught Li, Ching-yuen directly. It is historically unclear if Jiulong Baguazhang is a branch of Dong, Hai-Chuan’s method imported to Emei Mountain by disciple of Yin Fu or if it stems from the Dragon Door Daoists that predate Dong, Hai-Chuan. In any case we can clearly say that the principles and method as they came into the Li family of Sichuan apparently originated from the mysterious Emei Mountain.